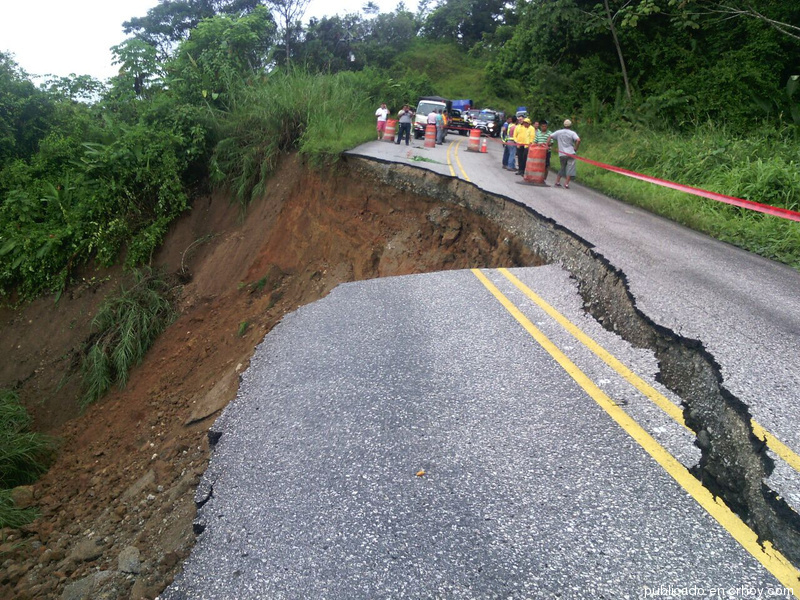 Roads in Costa Rica are not all designed to handle rainfall which can be problematic since it can rain…a lot. For example, tropical storm Nate caused widespread flooding, loss of life and wiped out sections of nearly every road on the Pacific side of Costa Rica. There’s nearly always a weather related closure or two. One problem is that since there’s inadequate drainage the roads simply wash down the hillside (derrumbe – collapse) or the hillside washes onto the road blocking it (deslizamiento – landslide). Sometimes luck is the most important factor. We spent last August dodging weather bullets. We traveled to Tamarindo, Tenorio, Arenal, Monteverde, Jaco, Nicoya, Manuel Antonio, the Osa, Chirripo, the Caribbean and more working on updates for the waterproof travel map. We somehow managed to enjoy 2-3 days of sunshine in each locale then escaped just as the flooding started. Even though every vehicle is required by law ($250 fine) to carry reflective safety triangles note the uniquely Costa Rican touch of using a heliconia flower a foot in front of the crater as a warning indicator for approaching drivers (the big orange barrels were added later). The photo shows the PanAmerican highway above Piedras Blancas National Park a few hours after we drove past this spot in a 10 inch per hour downpour on our way to perfectly clear skies at San Gerardo de Rivas. There are usually alternate routes available but they may add several hours to your drive time. When rains are particularly heavy everything may be washed out at once. There was a three day period one November when there was no way in or out of San Jose by road. The worst times of year are typically late May or June when the first gully washers of the season carry all the trash and natural debris downstream clogging culverts and piling against bridges in the central valley causing collapses. In the mountains the big landslides come in late October and November when the ground is already saturated and wet and a few more inches of precipitation triggers a collapse. Poor road design and construction also causes standing (or flowing) water in the traffic lanes. Many roads are flat or dipped rather than crowned and the lack of gutters, drainage ditches and culverts to contain the runoff causes water to flow across the road instead of alongside or under it. Hydroplaning and complete loss of control can occur at very low speeds when the water is deep enough. There are actual rivers to contend with across some roads in the rainy season. A small stream can become a raging torrent in a matter of minutes and things get interesting fast when there’s no bridge. A couple of roads in particular have some major rivers to cross. 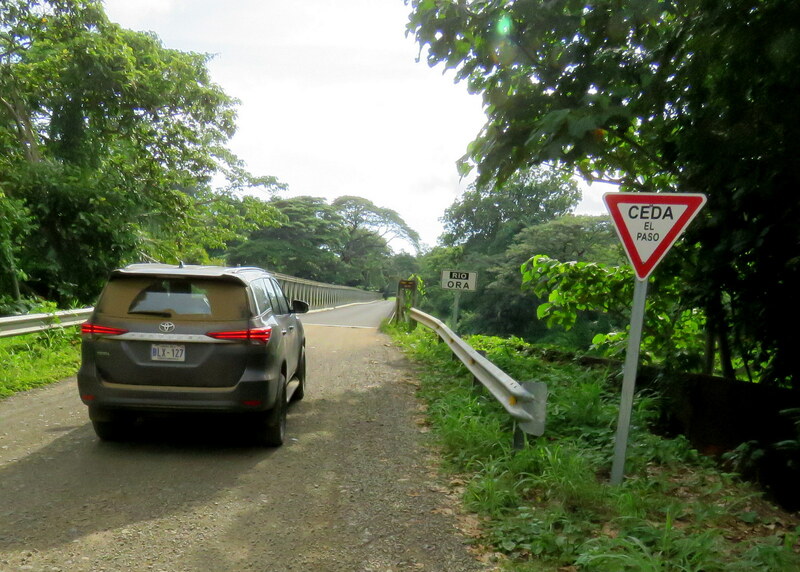 The coastal route 160 that skirts the Pacific side of the Nicoya peninsula has been improved a lot recently and some of the most notorious fords have been replaced with bridges. However, there are still some places it gets sketchy north of Nosara and south of Coyote. The Río Ora south of Sámara between playas Carrillo and Camaronal used to be one of the most likely places in Costa Rica to float your rental car downstream to complete destruction. A new Bailey bridge is far less exciting and adventurous but there’s still a side road down to the ford if you want to try your luck. In February 2019 one of the most infamous river crossings was eliminated. 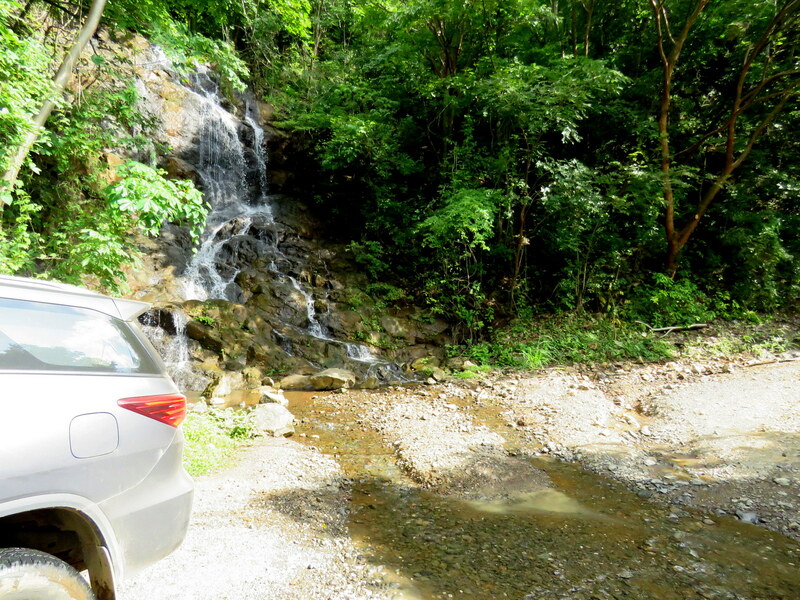 For decades driving the Osa Peninsula on the road from Rincon to Drake meant fording progressively larger streams until reaching the Río Drake which can be 50 meters wide and more than a meter deep in rainy season. It’s still adventurous but the inauguration of a new bridge means it’s passable year round. If you’ve never experienced a tropical aguacero you may find it difficult to believe it can rain so hard that you can’t see the front of your own hood let alone the road in front of you. The huge puddles that collect on the road are instantly transformed into reverse waterfalls when hit by an approaching eighteen wheeler. Blinding vertical sheets of water leap skyward and not only completely eliminate visibility but can impact your vehicle with enough force to knock it around. The best approach is to find somewhere safe to pull over and wait it out. That can be easier said than done though since there’s nearly never any shoulder. Driving at night is generally a bad idea that’s even riskier in the rainy season. 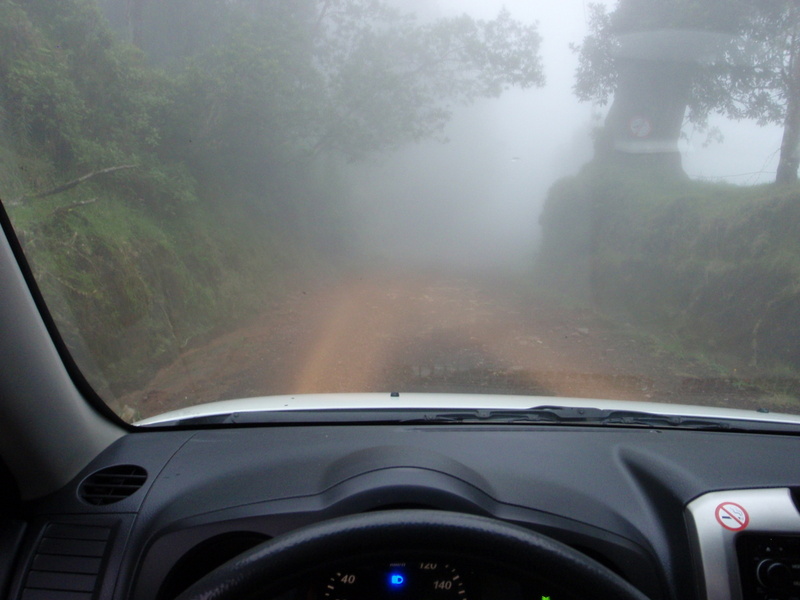 Reduced visibility from rain, fog or mist makes it even more challenging to navigate narrow, winding mountain roads with no lights, reflectors, painted lines or guard rails. The headlights of oncoming traffic transform into a blinding dazzle when scattered off raindrops. Of course you shouldn’t forget that the road may not simply look like it has disappeared ahead of you…it may actually be gone. Don’t assume you’ll be okay because you’re sticking with the main highways. All of the above applies to large sections of any road in Costa Rica. If there’s too much water maybe you should take a boat instead. 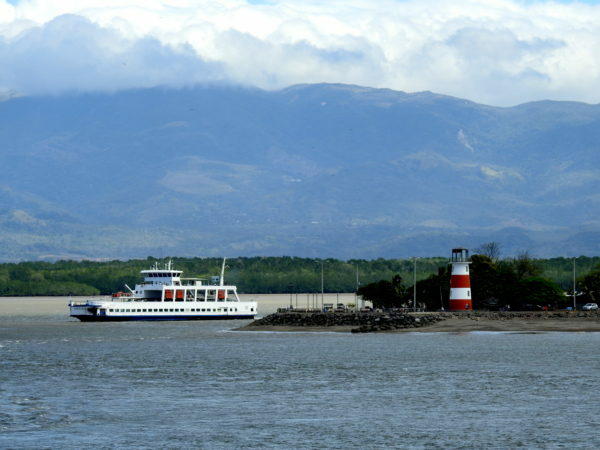 Ferries can reduce drive time and passenger lanchas can eliminate driving all together. Boats can be a great option in the rainy season – click to see routes. If you’re considering taking one of the ferry boats from Puntarenas to either Paquera or Naranjo on the Nicoya Peninsula check well in advance to make sure it’s running. Low season boat and dock maintenance or repairs have closed down service for several weeks three out of the last five years. The links below are the best we have found for official road and highway conditions. The Waze App has some live info on closures. However, if there is no data for some large segments of the roads it may be because there are no cars on them transmitting data. The agencies in charge have improved their update frequency and quality a great deal in the past few years BUT that does not guarantee that the information is current or complete. Especially where temporary repairs have been made the status can change rapidly and we recommend supplementing this list with a call to the lodge or hotel you’re headed to when in doubt.